Knowledge is the key to finding gold! If you are interested in looking for gold or learning how to find it, here is a collection of over fifty books and maps to get you started. The best way to waste your time looking for any mineral is to not know what you are doing or be looking in the wrong places. These maps and books will show you where to go and what to do when you get there. Over 50 Gold Books and Maps to Choose From! Have you ever wanted to pan for gold? Anyone can do it, and it's easy! Roy Lagal gives simple instructions on how to find gold by panning, or with a metal detector or dredge. Great for beginners! Click here for more information. A 6" x 9" paperback with 274 pages loaded with 101 locations in the Pacific Northwest where you can go out and find gold. It contains techniques and suggested equipment for each location. Click here for more information. This bestselling book is great for greenhorn gold-hunters who would like to know where and how to prospect for gold. Click here for more information. 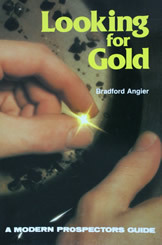 This is an informative book for anyone interested in gold prospecting. Bradford Angier covers all the basics and more: locations, equipment, laws and regulations, staking and working a claim, even campground grub recommendations. A good read for newcomers and seasoned prospectors alike! Click here for more information. How are gold deposits formed? Where can they be found? This book explores the "ancient channels": fossilized gold-bearing rivers. Click here for more information. An introduction to finding gold in stream and dry deposits. Learn about the geology of gold, equipment, techniques, basic prospecting and working a promising area. More information, table of contents. Written for the beginner in layman's language, this book gives you all the basics on gold panning. Click here for more information. Another outstanding guide by Delos Toole - essential for Nevada gold nugget hunting. This book is an 8.5" x 11" paperback with 140 pages loaded with topographic maps, gold placer mining districts, directions, even more maps, and lots of other useful information. Click here for more information. An indispensable guide for the California gold nugget hunter! This book has tons of topographic gold maps for Northern CA counties, and a bounty of other useful information. Click here for more information. Want to find the placer gold deposits in Arizona? Wouldn't it be nice if you had maps to tell you exactly where they are? Look no further. This 8.5" x 11" paperback book is loaded with Arizona gold maps. Click here for more information. Do you want to find gold in California? You'll have your work cut out for you with this handy book that is filled cover-to-cover with California gold maps and information. There are even directions to the gold sites! Click here for more information. There's gold in Oregon, and this book will help you find it! 144 pages of maps, directions, and tips. A must-have for the Oregon gold hunter! Click here for more information. A good dry washer is an important tool for the hopeful gold prospector. James Klein shares his years of experience with dry washing. Click here for more information. Lois DeLorenzo shares her experiences of hunting for gold with her husband. Written in a simple conversational tone and coupled with the author's own illustrations and hand-drawn maps, this book is an enjoyable read from cover to cover. Click here for more information. If you enjoy dredging for gold, then this book is for you! Dave McCracken tells you all you need to know about pay-streaks; what they are, how they are created, and most importantly, how to dredge them up without leaving gold behind! A smart investment for any dredger. Click here for more information. "What every gold dredger should know - Part 2"! Dave McCracken has so much knowledge about gold dredging to share, he couldn't fit it all in one book! Improve your dredging techniques in deep, cold, or fast waters, and learn some handy tips and secrets of the trade. Click here for more information. When prospecting for gold, learning about the geology of your area could have big payoffs! This book is written for experienced gold hunters, and examines "The relationship of Regional Geology to the Types of Placer Deposits (With Emphasis on Epithermal Deposits Forming Eluvial Placers and How to Metal Detect Them); Meteorites - Mining Districts / Gossans - Laterities". Click here for more information. A collection of 5 large maps covering the entire state of Arizona. These maps show gold and silver prospecting areas, and locations where gems and minerals have been found. Click here for more information. A collection of 5 large maps covering Northern California. These maps show gold and silver prospecting areas, and locations where gems and minerals have been found. Click here for more information. A collection of 5 large maps covering Southern California. These maps show gold and silver prospecting areas, and locations where gems and minerals have been found. Click here for more information. A collection of 5 large maps covering the entire state of Colorado. These maps show gold and silver prospecting areas, and locations where gems and minerals have been found. Click here for more information. A collection of 5 large maps covering the entire state of Idaho. These maps show gold and silver prospecting areas, and locations where gems and minerals have been found. Click here for more information. A collection of 5 large maps covering the entire state of Montana. These maps show gold and silver prospecting areas, and locations where gems and minerals have been found. Click here for more information. A collection of 5 large maps covering the entire state of Nevada. These maps show gold and silver prospecting areas, and locations where gems and minerals have been found. Click here for more information. A collection of 5 large maps covering the entire state of New Mexico. These maps show gold and silver prospecting areas, and locations where gems and minerals have been found. Click here for more information. A collection of 5 large maps covering the entire state of Oregon. These maps show gold and silver prospecting areas, and locations where gems and minerals have been found. Click here for more information. A collection of 5 large maps covering the entire state of Utah. These maps show gold and silver prospecting areas, and locations where gems and minerals have been found. Click here for more information. A collection of 5 large maps covering the entire state of Washington. These maps show gold and silver prospecting areas, and locations where gems and minerals have been found. Click here for more information. This book has 148 pages that are packed with tons of information about gold placers and small-scale gold placering in Arizona. Click here for more information. Find Arizona's hidden gold placers! You can do it with the information contained in this book. If you have the determination and a little knowledge, the Arizona desert sands conceal secret gold placers, just waiting to be discovered - by you! Click here for more information. The secret gold hidden in the rivers of Northern California awaits those with a little bit of luck, and the knowledge contained in this book. Click here for more information. There's still lots of gold to be found in Southern California - you just have to know where to look! This book by James Klein, experienced prospector and the author of multiple gold mining books, can help make your search a success. Click here for more information. There is gold - gold! - waiting to be found in the deserts of California, Arizona, New Mexico, Utah and Nevada. This book is the key to making your next trip into the desert a little "richer" with a gold-hunting expedition. Click here for more information. Prospecting expert James Klein writes about finding gold in his favorite area, the Mother Lode region of California. From CA gold rush history to current times, this book will tell you where gold was, and can be, found in Mother Lode country. Click here for more information. This is a treasure-hunter's guide to finding gold and gemstones in NV. Includes road maps, mining locations, and ghost town stories, and relates the state's history, lore, and more. Click here for more information. Arizona placer gold is hiding in remote and seldom-explored areas of the state, waiting for you to find it! In this easy-to-read book, Ronald S. Wielgus will teach you how to find the gold that the others missed. Includes lots of maps and photos. Click here for more information. A quick and easy read for anyone interested in learning about diving for gold. Has lots of helpful illustrations. Click here for more information. Whether you'd like to spend your weekends finding gold, or are just curious about how it's done, check out this book. A.H. Ryan, Ph.D., explains the basics of gold mining and prospecting in a simple and straightforward fashion. Click here for more information. YOU can find gold with a metal detector - yes, indeed! A good metal detector will certainly help with your prospecting, but the most powerful tool for finding gold...is knowledge. Get tips from the experts right here in this book, by long-time veterans in the field Charles Garrett and Roy Lagal. Click here for more information. Browse articles that discuss how to find gold by using a variety of techniques. Presented in magazine format, with lots and lots of photos. Click here for more information. There are plenty of gold prospecting books for the beginner, and many that are written on advanced topics, but what about the amateur? The Gold Prospectors Handbook fills that gap in between. Find out how to become more proficient at prospecting and small mining operations...learning just one new thing can make all the difference! Click here for more information. Treasure hunters will have lots more luck if they know where to look, and how to properly stake a claim on any bounty they find. What is the right way to go about prospecting? This 6" x 9" paperback will tell you all about these things and much more in its 303 pages. Click here for more information. This informative guide is a county-by-county directory to Arizona's placer gold. Book comes with a large 20" x 20" map showing reported locations of placer gold deposits in Arizona. Click here for more information. If you are looking for the placer gold deposits in Nevada, this guidebook and map will make your hunt a whole lot easier! Includes a large 20.5" x 26.5" Nevada placer deposit map. Click here for more information. A straightforward, no-nonsense guide to the locations where placer gold deposits have been discovered in New Mexico. Accompanied by a large 20.5" x 24" map with reported gold-bearing areas highlighted. Click here for more information. If you are searching for gold in the Sierra Nevada, do yourself a favor and get a copy of this book. It is a compilation of a century's worth of mineral resource surveys, mine production data, river dredging locations, over 20 county maps, and much more. A small investment to increase your odds of striking it rich! Click here for more information. So, you're ready to find some gold! What happens after that? This book will tell you exactly how to stake a mining claim, file it, and keep it. Click here for more information. "For the Man Who Wants to Know The Secrets of Successful Drywashing." If you're into drywashing for gold, don't miss this book by expert Jim Straight. Has information that can be used with any type, style, or size drywasher. Features: old-timer tips, moisture calculations, troubleshooting, tables and charts, and more. Click here for more information. Build your own drywasher and head out into the desert to find gold! This booklet is a 5.5" x 8.5" paperback with 25 pages, and includes blueprints for making your own drywasher. Click here for more information. Al McGowen draws from a lifetime of gold mining experience to tell you the best, tried-and-true methods for gold extraction. A simple and straightforward book with practical tips and hints. Click here for more information.